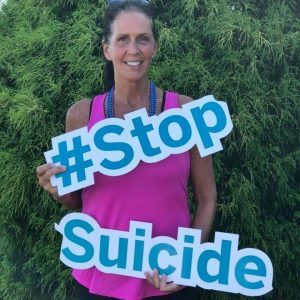 Suicide — such an important topic for the living. Suicide. How it can hurt when somebody we know commits suicide! Scary, too. Come read some helpful ideas, gained from RES Energy HEALING. This morning I spoke with my friend JENNY, out walking her dog. On Facebook, I saw how she has publicly supported suicide prevention. Showing the photo that she’s given me permission to post at the top of today’s article. “Has anything happened to someone you know?” I asked her with concern. No, the suicide happened years ago. Still terribly sad. We couldn’t talk more. JENNY had to go to work. Plus, as usual, her dog Chudleigh was barking like crazy. That very vigilant pooch hasn’t gotten used to me yet. I dedicate today’s article to JENNY. And all her family members who may be grieving still. Over the loss of a 14-year-old. Blog-Buddies, do you also know people in shock and grief over a suicide? Please share today’s article with them. Also the one to follow. My personal experience of suicide comes from facilitating Energy HEALING Sessions. Using the distinctive skills of Rosetree Energy Spirituality (RES). Here’s a summary of what I’ve learned over the years, helping clients. Of course that’s tricky. And it’s so important to reach out for help. Including professional grief counselors and clergy and therapists, as appropriate. Plus friends. Because RES sessions move out STUFF. Stored energetic souvenirs of unpleasant past events. Astral-level garbage, stored within your aura. At the level of the subconscious mind. Just one session can make a huge difference. For instance, my client Gladys couldn’t stop thinking about her ex-boyfriend, Joe. News of his suicide shook her. Months later, that inner shaking still wouldn’t let up. But after I facilitated cutting her cord of attachment to Joe? Gladys understood why she couldn’t let go. Guilt over the suicide ended. Gladys felt more like herself. Also, of course, she still had her spiritual tie to Joe. Which helped her to make her peace to what had happened. Sometimes a ghost of the person will haunt my client. Whether regularly or intermittently. Helping that soul to move forward? That’s another skill set I can use, as appropriate. And comfort. RES Energy RESEARCH can also bring comfort. As in helping my client to understand better what was happening during their last conversation. No psychic reading, this skill is simply an example of advanced energetic literacy skills. Learn more about energetic literacy here. Of course, you don’t have to know details like this just to become an RES client! Just make an appointment. Bring the above-mentioned intention. Let me find an appropriate way to help you, proceeding accordingly. Then see what improves for you! The Future Of People You Know Who Committed Suicide? Admittedly, my perspective is controversial. At least I can promise you that I’m no mere theory-maker. All that I’m about to share in Part Two of this article will be based on my professional experience, using deeper perception. Do any of you have a story to share? Concerning your own experiences with people who ended their own lives. What helped you to move on? And do you have any fears about them from a religious or spiritual perspective? That last topic, especially, is where I believe I can bring comfort. Sharing my direct experiences, helping RES clients. Part Two of this short series will be more meaningful if some of you Blog-Buddies contribute. Please know that you can write here anonymously. Any time! Just write in the first line of your comment what you would like me to call you. Preferably you will write brief comments, one after another. In keeping with the style at this blog. But if it’s easier to send one long bit of writing, no worries. I’ll break it up for you, changing nothing except for the spacing. What a great blog post topic. Several years ago a man I know committed suicide. He was a lovely person, a retired judge and orchard keeper. I worked for him briefly in his orchard, as a part time job. We always had fun conversations that cheered both of us up. I was in a not great situation. He actually gifted me money out of the blue so that I could leave the place where I was. Then very soon after he died, under mysterious circumstances. I found out about his death I was shocked, and I intuitively knew it was suicide. I now understood the gift of money was a parting gift. I felt sad and guilty and couldn’t stop wondering about his death. Some months later I had an RES session where we cut the cord to him. It always did cheer him up to see me, and he loved our conversations. But he was a deeply unhappy person. Rose, who facilitated the session, found that his ghost was visiting me after death, just to make sure I was all right. It was very kindly intended, but each visit would depress me, because it stimulated the cord of attachment. Rose facilitated a healing as part of our session, to help him move on. This session helped me so much. Now I remember him only with huge love. I’m not still wondering if he committed suicide or why. I don’t feel guilty about the money he left me. I feel awe for the gift that he gave me and very lucky to have known him. I am also happy to know that he has now moved on to his next incarnation, and is not stuck in limbo. KYLIE, thank you so much for being the first to speak out on a topic that has probably touched all of our lives. And you’ve added to my determination to write Part Two of this series. Who else has stories, I wonder. He was/is a beautiful soul and I no longer feel sad about the choice he made to leave earth. He chose the time and place, and he had his reasons for doing so. I don’t think that anyone could have stopped him. And I am sure that the end of this life was not the end for his soul. I knew a young man in his twenties who committed suicide. We weren’t close, we were just acquaintances, but I always felt sad for him to have been hiding so much pain. I’ve often wondered if he’s ok. I wonder if he’s lost and if he has found his way to peace. My father committed suicide when I was 19. At the time I recognized it as a tragedy from a very religious perspective. I didn’t quite know how to deal with the certainty that he would spend eternity burning in hell. Older now, I no longer believe in hell or eternal damnation. But I do still have many unanswered questions about the man, the reasons, the timing. He was a distant father, someone I never got to know much as a child and not at all as an adult. We were never close, even when he lived with us. Sometimes I’ve wondered if he’s ever ‘checked in’ to see how I’m doing. Not because I could ‘feel’ him, more like I fantasized that he cared enough to have a peek. The other suicide in my life was my father-in-law. He was obvioulsy mentally unbalanced, whereas my dad seemed unstable as far as life’s responsibilities. Both appeared to be inwardly tormented, death bringing the peace they could never attain in life. Not brave enough to attempt cutting these cords of attachments, going to leave that to an RES professional! Thanks for your very personal and touching shares here, VALERIE and LIANE. In Part Two of this little series, I won’t supply responses to all you have raised. Because this Founder of RES is not involved in paranormal activities, am not an astral specialist — nor do I want to be. Because I strongly believe that The Age of Awakening rewards those who co-create with the Divine. During the Age of Faith, it was more the time when some folks would get involved in the astral… such as thinking that it would be the job of somebody freed from an incarnation to keep on peeking in on you to take care of you. Personally, I question that sort of anthropomorphism. Angels, back in their light bodies, get to move on from that previous lifetime. Living humanly is up to us, the living. Surely. Please consider, you have what you need to evolve. Including human common sense, human friends, human interests. Plus your connection to God. And your ability, now, to learn how to co-create with the Divine to facilitate appropriate healing of STUFF. Also, as described in some detail in “Use Your Power of Command for Spiritual Cleansing and Protection,” you’ve got your own personal, Divinely authorized angel team. If you need angelic help, providing that is their job. Not the job of an astral being whom you once new in human form. Speaking of how all of us humans can do our appropriate jobs, for pete’s sake, LIANE. If somebody has been maybe haunting you, this is not the skill level for self-help cutting cords of attachment in my how-to books. Instead, this is potentially a somewhat bigger healing, right? It can take years for me to train RES Apprentices. Before they graduate as RES Practitioners. Even someone very talented and committed to learning does not have professional-level skill when doing self-help, right? Not if you wish to gain the best results…. So you were spot on about having an RES session, rather than making this a do-it-yourself project. Thank you for writing that. Anyway, everybody, I am looking forward to sharing other info that might be helpful in Part Two. And I very much appreciate all the comments you Blog-Buddies have shared so far.